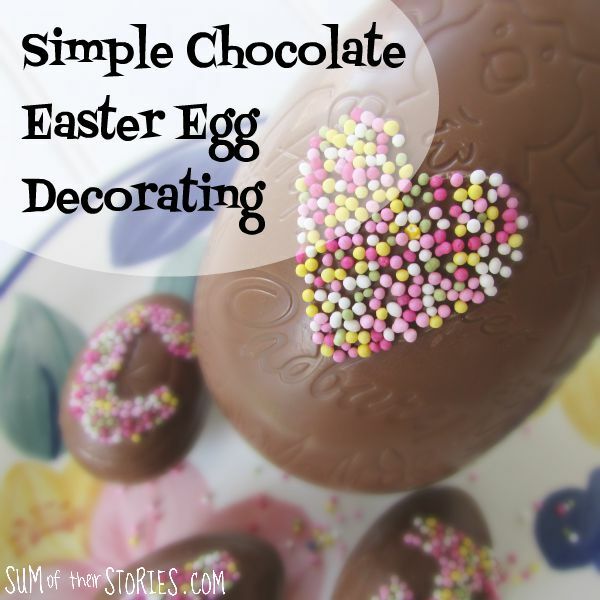 Here’s a super simple, quick and easy way to decorate and personalise a shop bought chocolate Easter egg. It’s time for the Pinterest Challenge again, when I join a group of fellow creative bloggers and we all take an idea we pinned to one of our many Pinterest boards and actually give it a try. 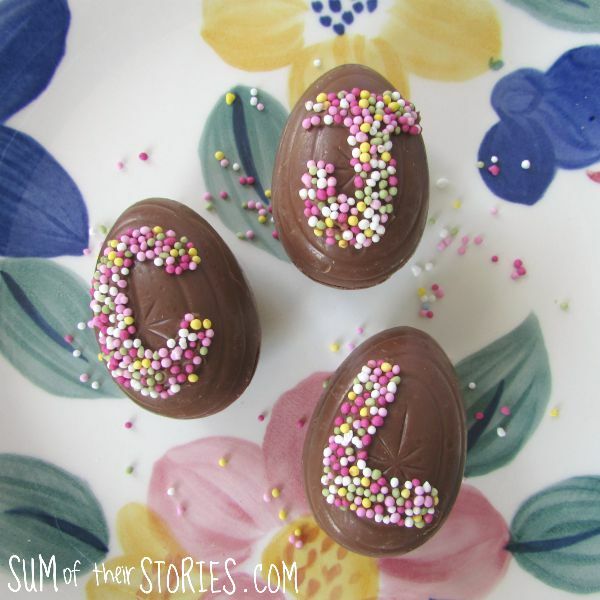 This month I’m sharing a chocolate Easter egg decorating idea, based on this idea from the wonderful French blog Carnets Parisiens. Cyrielle from Carnets Parisiens explains how to make beautiful eggs from scratch involving tempering chocolate. Last time I tried tempering chocolate it all went horribly wrong and we were forced to eat large amounts of bloomed chocolate, how dreadful for us! To keep things simple I’ve used shop bought chocolate eggs and just added some decoration. I used what we call ‘hundreds and thousands’ here in the UK, also known as sprinkles. I believe the posh name for them is nonpareils, although when I googled nonpareils I got a lot of photos of chocolate buttons covered in hundreds and thousands. Here those sweets are called ‘jazzies’ so I’m not too sure. What a confusing world we live in! Anyway, whatever you call them the photos will help you know what I mean. I tried out a few idea, with varying degrees of success, here we go. a clean paint brush - I’d recommend getting a new one! Those boxes of Cadburys creme eggs had one large hollow egg and one small creme egg in them, I ended up using both. I also got all my full collection of sprinkles out for the photo but didn’t end up using them all. Remove any foil on your chocolate egg. My larger chocolate eggs had more pattern on it than I was expecting, including a Happy Easter message from Cadbury - that’s nice isn’t it? I think a smooth egg would have been more sophisticated but I just carried on with what I had and it turned out ok. Unless you buy an egg that’s unwrapped though it’s hard to know what it’s like under that foil wrapping. My eggs were also in 2 halves. It’s really easy to stick them together. Take a few squares of your bar of chocolate and melt it, either in a bowl over a saucepan of hot water or VERY GENTLY in the microwave. Paint the melted chocolate round the edge and then squeeze gently together. Hold for a few seconds and then place the egg in a supportive nest that you can fashion from the foil wrapping. Now take more of the melted chocolate and paint a heart shape in the middle of the egg. Paint it on quite thick, if the chocolate is too thin the sprinkles will all fall off! 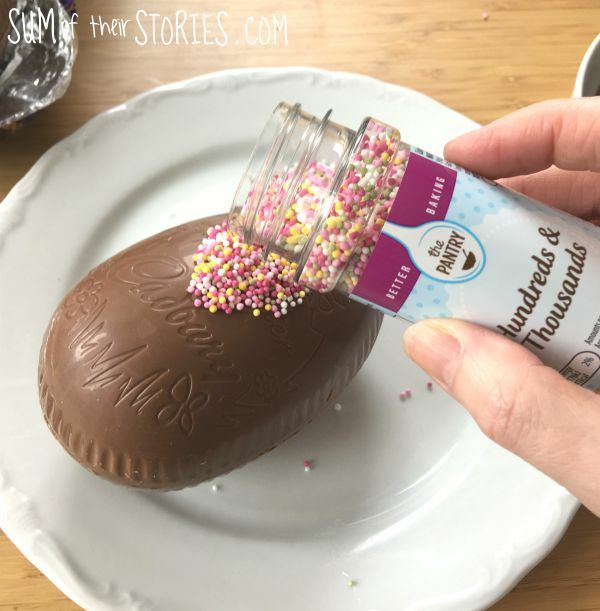 Quickly sprinkle all over with your hundreds and thousands. Put a plate underneath to catch the excess but be warned, these little blighters are surprisingly bouncy and will go EVERYWHERE! Give the egg a shake upside down over the plate and then leave to set for a few minutes. You can use different colours to get a different look. For this blue heart I painted the chocolate heart just a little bit bigger which I think I prefer. 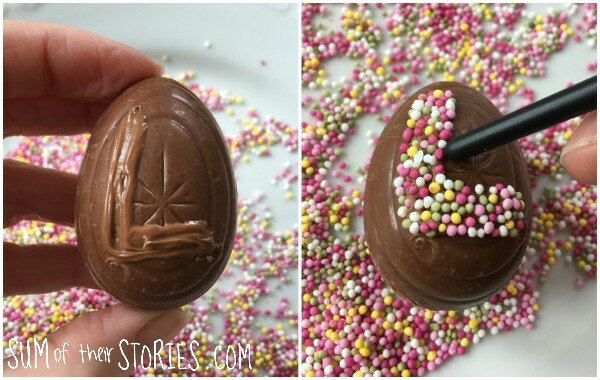 As the eggs I had bought had the message and design already on them I played around and tried to highlight the Happy Easter message by circling it with chocolate and sprinkles. I feel this is a bit less successful but I’ve included it here in case you love it! As my Easter egg boxes came with creme eggs to I decided to have a go at decorating them too, this time with a little personalisation. The method is exactly the same, paint an initial on with the melted chocolate and then sprinkle quickly before it sets. I found it helpful to just tidy the letters up before the chocolate set by pushing the sprinkles in gently with the end of the paintbrush. These turned out quite nicely, if I do say so myself! 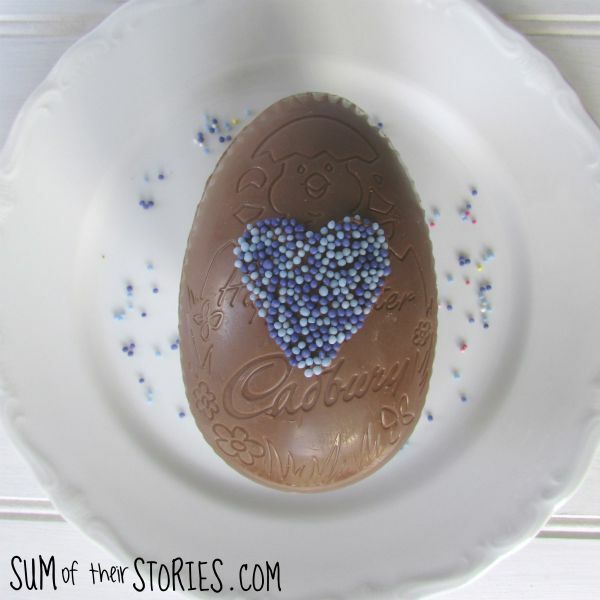 A simple and inexpensive way to create a personal chocolate Easter egg.